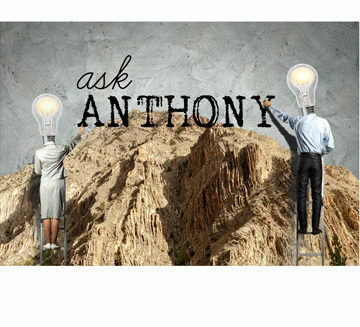 Ask Anthony: What Concentration Should I Pursue for My Civil Engineering Degree? What concentration should I pursue for my civil engineering degree, and how much does it affect my ability to change paths later in my career? I get these related questions often from civil engineering students who are confused as to what concentration they should focus on for their civil engineering bachelor’s and/or master’s degree program. Some schools don’t allow for a specific concentration in undergraduate, whereas some do. From my own experience as a civil engineer, and from speaking with other civil engineering professionals, I can say I don’t think your degree concentration will prohibit you from changing fields as a practicing civil engineer. When I was in my undergraduate civil engineering program, there was no class dedicated to land development, which is what I ultimately ended up doing. I learned most of what I needed on the job. That being said, my base courses like Hydrology, Geotechnical Engineering 101, and Structural Engineering were all helpful in different ways in my land development work. The truth is that civil engineering is an always changing field, and on top of that, as a college student, you most likely aren’t 100-percent sure (or even close to being sure) which discipline you really want to practice. So for those two reasons, don’t get paranoid that your concentration selection in school is binding. 1. Try to take several broad courses in as many civil engineering disciplines as possible. 2. Attempt to work in different civil disciplines through different civil engineering internships throughout school. 3. If you are forced to select a concentration, consider taking the minimum number of courses in that field so you can still take courses on other topics. 4. Never feel that your degree concentration binds you for life. 1. Waiting to pursue a master’s degree until you’ve had some experience and have a good feel for what discipline you are interested in. 2. Considering the pursuit of a master’s degree in a different concentration than your undergraduate degree. For example, I had a general civil engineering undergraduate degree that was focused in design, so I did my M.S. in civil engineering with an emphasis on construction management. 3. Not seeking a master’s degree solely to bolster your resume, but making sure you choose a discipline that matters for your career. Beyond the advice that I’ve given above, just know that you can always change disciplines as a civil engineer, as long as you become knowledgeable in the desired discipline. If you then step up to become a licensed professional engineer, you have an ethical and professional responsibility to be competent in the type of work you are signing off on so that you protect the public, health, safety and welfare. While licensure laws vary among states, your work as a PE doesn’t necessarily have to be in the discipline you went to school for. Please share you experiences in the comments section below on how the selection of a civil engineering degree concentration has affected your career path. 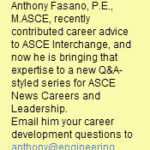 Anthony Fasano, P.E., M.ASCE, is the founder of the Engineering Career Coach website, which has helped thousands of engineers develop their business and leadership skills. He hosts the Civil Engineering Podcast, and is the author of a bestselling book for engineers, Engineer Your Own Success. 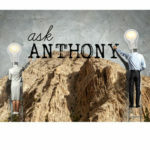 You can download a free video series on his website that will give you the tools needed to immediately improve your networking and communication skills by clicking here. 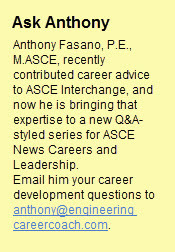 I disagree mildly with ” Waiting to pursue a master’s degree until you’ve had some experience and have a good feel for what discipline you are interested in.” That’s good advice for some, but not all, particularly in light of ASCE’s Raise the Bar initiatives. With the 30 hours of post-BS coursework becoming recommended for the P.E., waiting can be hazardous to your career. Getting those 30 hours while working is doable but requires dedication and a cooperative employer. Going back to school after several years practice, as I did, is a difficult transition and doesn’t work for everyone. William good point, and I agree, a lot of these questions are really a case-by-case basis for each individual. I understand Raise the Bar and it’s a good concept, I just don’t like seeing civil engineers get master’s degrees just to get them and then not use what they learned because their career changes course in a year’s time. Their are so many different things a CE can do. Good feedback — thanks.